Whether your company is brand new or well-established, maintaining a successful social media marketing campaign is an essential way to reach today's customer base. 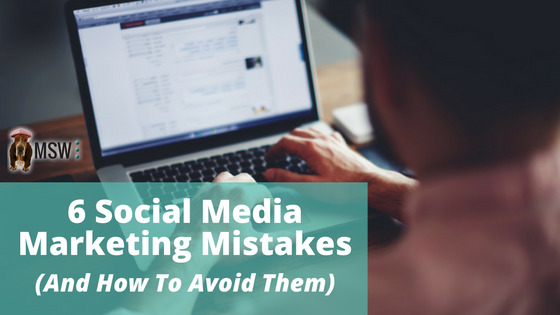 As with most things, there are certain strategies that lend themselves to developing a strong social media presence - and certain pitfalls that should be avoided. This week, our internet marketing professionals at the Lake of the Ozarks are here to explore some mistakes that can lead to unsuccessful social media campaigns. Don't fall victim to these common errors! Do you know someone who only talks about himself? At a certain point (and it usually doesn't take very long), listening to him drone on and on about his own personal accomplishments will become less than interesting to say the least. The same logic applies to companies on social media. Rather than constantly publishing "salesy" posts, mix up your message by including tips, advice, behind-the-scenes pics, and other information that will appeal to your target audience. You can also share relevant content from other companies. Social media is all about building strong relationships with your customers to establish loyalty and trust. A social media campaign requires a significant investment of time and energy in order to become (and remain) successful. If your campaign ends abruptly, you will leave your followers wondering where you went and why you disappeared. One of the best things about social media is that it enables communication with your customers to become a two-way street: you can deliver sales messages and reveal behind-the-scenes pictures of office shenanigans, and your customers can provide feedback and ask questions. Check your notifications regularly so that you can respond to your customers' comments and messages in a timely fashion. A few effective and properly placed hashtags can make the difference between a good social media campaign and a great one. However, not only will using excessive or irrelevant hashtags not propel your marketing campaign to the next level - it may actually hurt your cause! Most people find the use of excessive hashtags annoying, and may unfollow your brand if you adopt the habit. Instagram is the only channel where multiple hashtags may be beneficial. For all other channels, we recommend using a maximum of 2-3 hashtags per post. Successful social media campaigns take time to develop. While it's true that effective campaigns may take off suddenly, this success never truly happens overnight. Rather, these sudden successes are often the result of months of patient planning and strategizing to build the foundation for an effective campaign. Don't sell yourself short by giving up on your campaign before it has a chance to become successful. Most campaigns require a minimum of 6 months (and sometimes longer) before they become successful. Nothing riuns a reputations faster than typos and gramatical and spelling error. (See what we did there?) Publishing posts and/or blogs that are littered with typos, grammatical inconsistencies, and spelling errors is a guaranteed way to hurt your company's credibility. Proofreading your posts and blogs multiple times before hitting "publish" is absolutely essential. We're Here To Help With Your Social Media Campaign! Developing and maintaining an effective social media campaign requires a great deal of time and energy. If you and/or your employees are having trouble committing the time and attention required, or if you are not confident in the strategies required for success, consider seeking assistance from skilled content marketers. Our internet marketing professionals have a great deal of experience managing social media campaigns for our client companies, and we would be honored to assist with your campaign. Visit our website at www.mswinteractivedesigns.com/social-media.html for more information about our social media services, or give us a call at 573-552-8403. We look forward to talking with you!